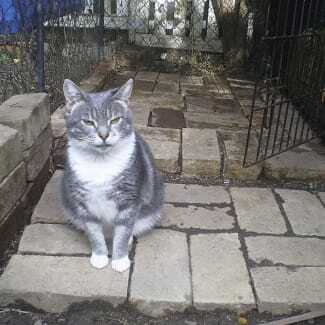 Catmint Cottage Street Cat Rescue is a Sydney, N.S.W. 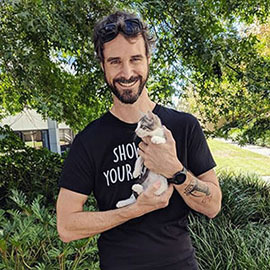 Australia based charity that specializes in rescuing and rehoming abandoned street cats and at times cats from death row. We are not a shelter but a group of hard working volunteers who rescue, foster, medicate, socialise and advertise our rescued cats with the aim being to find them a home of their own. We understand that larger shelters cannot operate in the same way. Our protocol is that every animal deserves a chance. We have taken on many hard cases and always commit to their rehabilitation however long that takes. 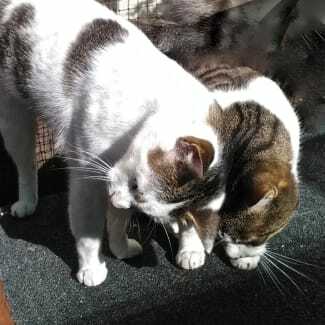 We rescue the aged, the infirm, kittens and, their mothers and what is often seen to be the 'the unadoptable,: the FIV+, the unsocialised and those with chronic conditions in either health or personality. We have some amazing stories to tell. The impossible can become the possible. We have many special needs cats which we are happy to adopt out to the right homes. All cats adopted come with support, guidance and a trial period. To say how much we have learned from these cats ourselves is something that can't be measured. They teach us about love, life and what is important. Please adopt, donate or volunteer to help us continue this work. Mum Mia come to us with her new born kitten Millie, and was very scared and not approachable without creative means of distraction and protection! With patience and time, she has let herself enjoy chin rubs and recently pats along her back, but you need to ask her first if she is in the mood for it :) Like many of the other cats she hangs out with, she enjoys chasing string toys and lazing about up on her cat tree, taking in the sights and sounds of the day. She has an inner kitten side that comes out when it's play time and chirps in delight at the chase. 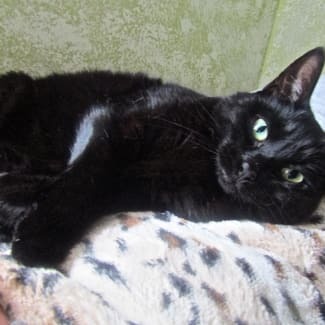 She is best suited to a calm adult home that is happy to give her the time, space and love needed to gain her trust and help her finally feel at home where she will give you the loyalty and love in return for being there for her. Millie came to us as a single newborn with her mum Mia. Mum, was very scared and not approachable without creative means of distraction and protection! Perhaps mum's influence rubbed off on Millie as she's just not that thrilled about cuddles or pats, despite getting them from a young age. She prefers to hang out with her friends or on her own unless it's meal or playtime ... that's when she'll give in and let you pick her up for a cuddle or stay still for a pat. The look on her face though is quite hilarious as you can tell she is just going through the motions to let you get it out of your system and quickly move on. I'm hopeful she's still to meet the right human cat whisperer that will break down her walls. Maybe that human is you? 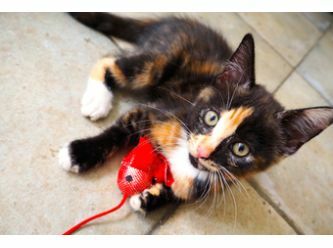 ​ Like many of the other cats she hangs out with, she enjoys chasing string toys and lazing about up on her cat tree, taking in the sights and sounds of the day. She does give new cats a bit of a tough time before being accepted into the circle so will be happiest rehomed on her own, or with one of her friends/mum. She still loves to have an occassional rumble with her mum. It's very sweet to see those moments that show how much they love each other, even though she is a big girl now. Tinkerbell is an attractive girl, a little too heavy to fly these days but nevertheless still has a magic quality about her! Tinkerbell had four kittens that she kept under the building at a western suburbs school. Small world. Life goes in circles, the very same building I was taught at until I was nine. For a young mum without the benefit of a family structure, Tinkerbell had a hard time keeping her kids under control. Once they discovered playtime they kept running in all directions and that was how Tink was discovered. A couple of kindly teachers started to leave food for them with a plan to catch her offspring. Although Tinkerbell was in dire need of the calories she tried to guard her kittens from capture, standing in front of them, blocking their escape and losing them one by one. Tinkerbell was trapped by us and desexed, with the plan to go back to school but in the scheme of things plans never seem to work very well as many a wise person has noted. For me it seemed like a lonely existence for one small cat and the longer she stayed the harder it was. A learning relationship ensued. She swiped and hissed, I constantly reminded her that her board and keep were not cheap; I had likely saved her life from that of a vagrant existence had I not? We did eventually come to an understanding. Please watch the videos, they are entertaining :) It is high time Tinkerbell found her own home, her own friends and family and the safety and warmth of real companionship. She so deserves it and is so worth it. If you are looking for an uncomplicated cat then Sammy is your man. 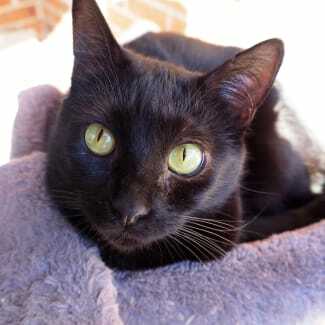 This young chap is a co-operative little soul who happily mixes with other cats, eats well, plays nicely and loves a pat. He has a sense of integrity, resisting his team leader's (Bryn) suggestions of mischievous ideas and creative dramas :) or the juvenile adventures that only a teenage boy could come up with if said teenage boy is a cat! Sammy is a blessing to have around. He is yet to realize his full potential in a family home where he can develop his relationship with people. Having cat company would be ideal too. Jedda, wonderful mother cat! 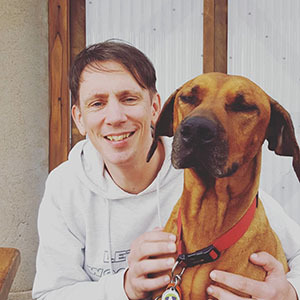 from the streets of Liverpool where she valiantly tried to fend for her four babies before coming in to care with us, Jedda has displayed a sweet loving nature and an appreciation of life. Her babies have all gone to good homes but Jedda has stayed on waiting for her own. 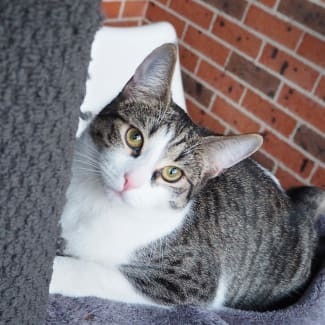 This sleek loving young lady cat timidly seeks affection and is waiting to blossom with her very own people who will have more time to give her. Jedda has access to an outdoor lookout which she has embraced with much enthusiasm spending most of her time out there watching nature and sleeping in the afternoon breeze before dinner time. Please let us know if you would like more information or would like to meet her.